IPv6-Workshop is the name of my book and the accompanying seminar series. It was first published in 2013 and was a category bestseller at Amazon Germany in 2014. Since June 2017, I give the ebook away for free and charge as little as Amazon allows me to for the printed version. My motivation is to help more people understand IPv6 and to speed up migration to the future Internet protocol. 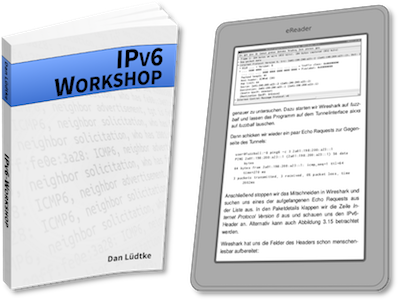 Download the book for free at the IPv6-Workshop project page 🇩🇪.